Too Confusing? You Guessed it…Get the Tools and Make a Connection! Let’s just imagine for a moment that you are in the middle of the store to buy a rug. You read the dimensions but struggle to imagine how long the rug really is…what do you do? You connect this problem with something you know…maybe your own height, maybe you picture a ruler or a measuring tape. The key is, as an adult you have life experiences to connect them to. Sadly, our elementary students might not have these real world connections to make quite yet, so we need to give it to them. I gave my group this problem, which like usual resulted in many blank stares and questioning faces. I certainly do not blame them, the first time I saw a problem like that I had NO idea what to do. None of us did…we just don’t remember the feeling. At first they wanted to guess what to do with the problem. 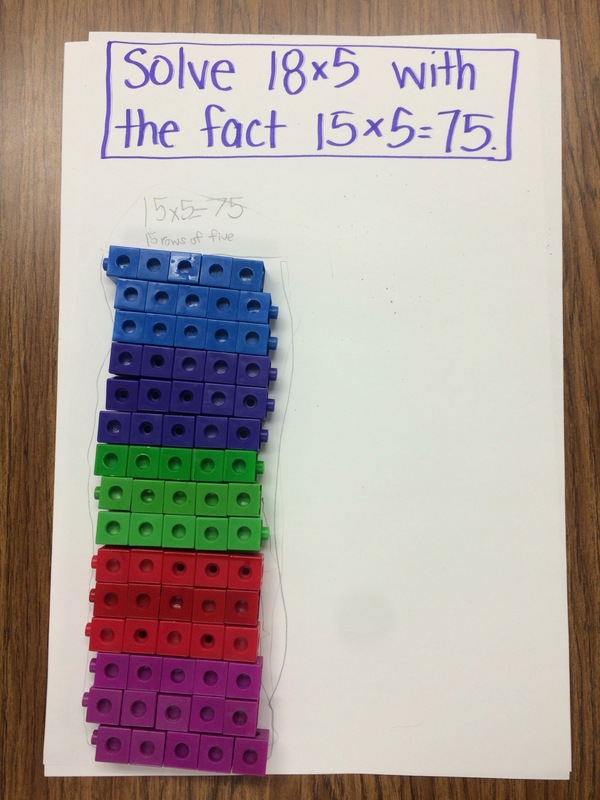 They suggested just adding 18, them suggested multiplying 75 by 18 to find the total. Many of them wanted to try the algorithm, but to see if they conceptually understood what they were doing I wanted them to show me how 15×5 could be used to solve that new fact. So of course after a few confusing minutes we broke out the tools and built 15 rows of 5. Enter the connection and the ability for them to build just another 3 people who were all walking 5 dogs each on their leashes. It was quite the dog party, but hey it worked! Now the goal in this case for these students is to pull tools at some point to see if they can represent these problems with drawings, and better yet area models so that we can link this to measurement and more. Once they do this, they will become unstoppable mathematicians! Learning to memorize something without any connection seems like a near impossible feat. Memorizing a map is very difficult for me when I travel, I need it with me the whole time to connect landmarks, buildings and other streets to remember the streets I have been on. I still haven’t figured out exactly how I ever memorized my multiplication facts as a child. It must have been a miracle, although I do remember having to actually re-LEARN my facts when I became a math teacher. I am kind of embarrassed to admit that fact, but when I sit back and think about it, should I be embarrassed about that? I think I was made to believe that the faster I could recite those facts the smarter I was. The more I memorized in math, the better math student I was. I had no idea why I did any of the things I did and just hoped I could rely on my memory. I was one of the lucky students that was able to do this…especially in high school math. But students who cannot easily memorize have to have something else to connect these facts to. After exploring the meaning of a fact like 5 x 7 (5 bags of 7 apples, 5 packs of 7 pieces of gum, 5 rows of 7 seats), we started to draw visuals of these things. 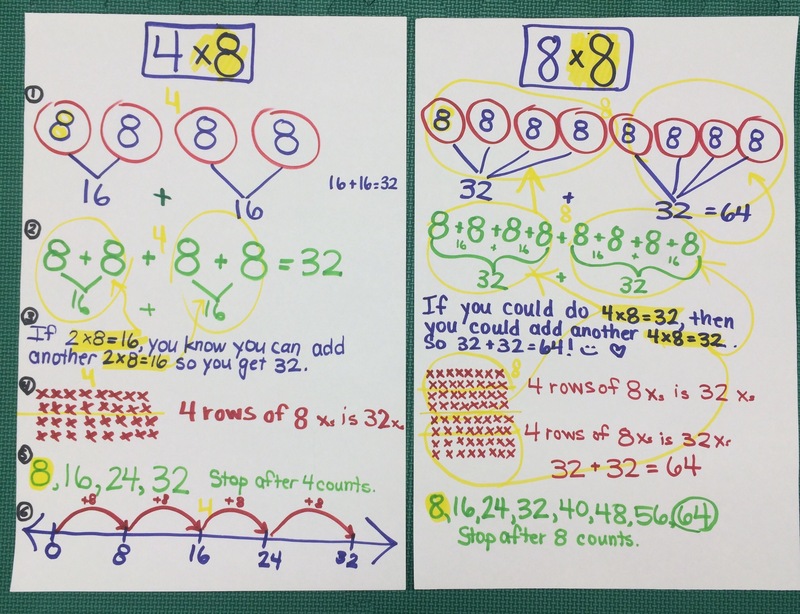 Drawing these visuals allowed my students to have something to connect multiplication to. Not only that, 6 x 7 is just one more group/row of 7! Eureka! Isn’t this good for all students? Not just those who struggle? The answer is YES. With a commitment to conceptual understanding we set them up for success in higher level math courses. 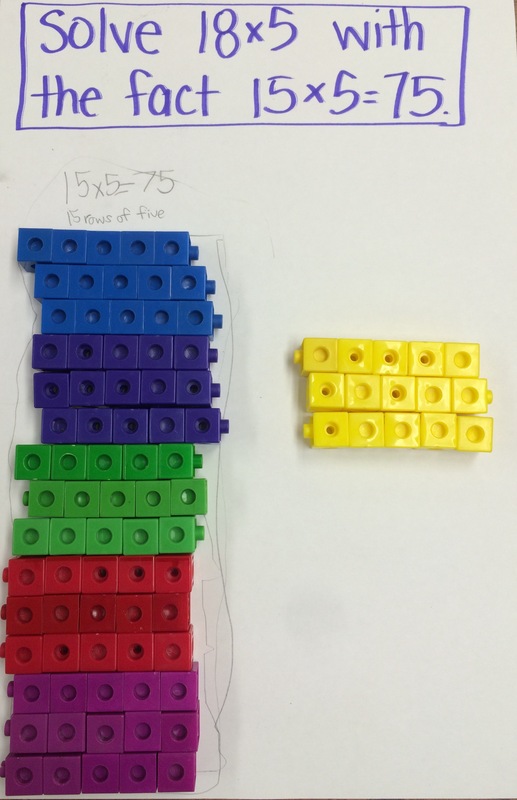 We’ve been doing number talks for a little over a month now, and it has been very exciting to see all the ways my students are representing numbers. What I have noticed lately though, is they aren’t seeing relationships between numbers. In the example below, they still began to solve 8×8 without paying any attention to the 4×8 that we had JUST solved… Which was also posted right next to it. 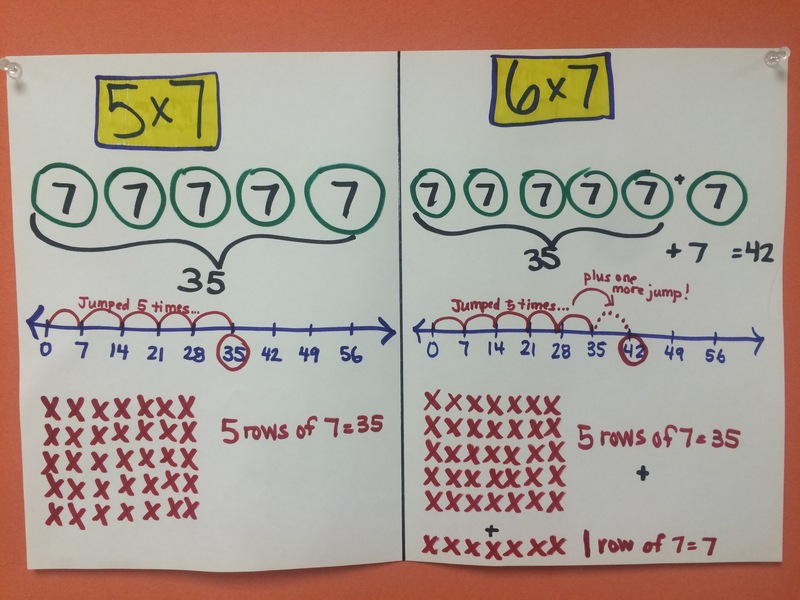 I strategically lined up similar strategies on the 8×8 poster thinking at the end we could compare. And once again I asked a general question “What do you notice on both posters?” For students that struggle that is not enough. They notice things like “both posters have the number 8 on it”, and other surfacey types of things. It goes against everything in me to just flat out tell students what to see, so I’ve been trying to sharpen my questioning skills. In this one I asked, “Where do you see 4×8 on both posters?” The lightbulbs went on! Believe it or not, these students all came in the next day and noticed this same connection between 3×7 and 6×7. Purposefully building up those connections is a great way to help them generalize it for other facts. I do believe also that building these movie theaters has helped them to solidify their conceptual understanding of multiplication and division. Feel free to share successful quetionning techniques that you have! Where Do You See 5? Students need to use concrete models, visual representations and numbers in conjunction to learn more deeply. But the REALLY deep learning comes when they can see patterns and connections. 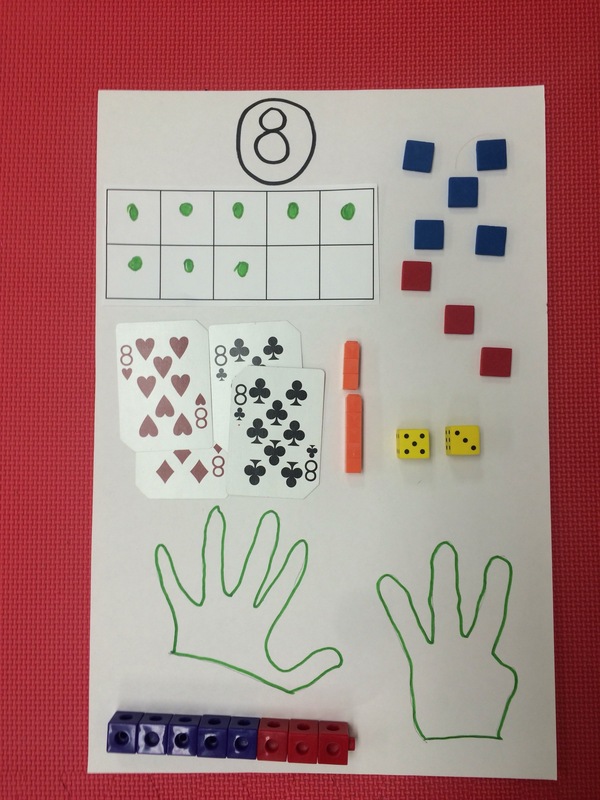 Helping students decompose numbers at an early age allows them to become very flexible thinkers. Everyone wins!